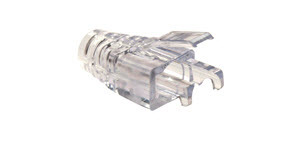 The Platinum Tools 100036C EZ-RJ45 Cat6+ Strain Relief is designed specifically to be crimped with the EZ-RJ45Ã‚Â® plugs. Two Patent Pending versions are offered for both the Cat5/5e and the Cat6 plugs. The primary strain relief of the plug locks the snag proof strain relief in place so they will not pull off, creating one, integral assembly. Once crimped, this design allows the plug's primary strain relief to relax slightly, preventing the cable pairs from being over compressed. This decrease in stress contributes to achieving peak performance.